See Universal Studios’ Christmas version of the world’s number one holiday parade with the Macy’s Holiday Parade at Universal Studios! For many of us, the Macy’s Thanksgiving Day Parade is a yearly TV tradition, even though we might never see it in person. Luckily though, after the Thanksgiving Day Parade wraps up in New York, many of the breathtaking balloons and floats get sent straight to Universal Studios Florida, and this year they’ll be here from December 6 to January 3! If you’ve never had the chance to see the parade in New York, The Macy’s Holiday Parade at Universal Studios is a fantastic alternative that leaves nothing to be desired. Come see the Macy’s Holiday Parade at Universal Studios this year, and you and your family will experience a holiday parade like never before! Watch as the park comes alive with balloons and marching bands, sing-along songs with Santa and see floats beyond your wildest dreams. 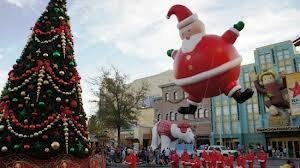 Have you been to Universal Studios’ Macy’s Holiday Parade? What about the Macy’s Thanksgiving Day Parade in New York? How was it?